It must be a record. I think 2015 will go down as one of the longest camellia blooming season in recent history. Camellia japonica var. japonica bloom time is generally March through early April. The camellias in my garden have been blooming since early January. I have three shrubs that have never bloomed, and yet they are currently blooming in an explosion of color. 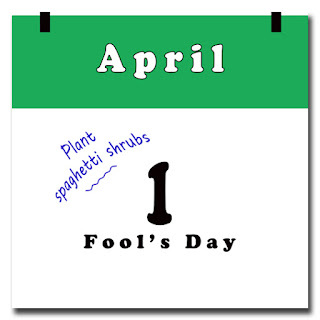 Perhaps these shrubs are getting enough sunlight to bloom this year? Or perhaps conditions were just right last year to set bud. Cooler than average night time temperatures also appear to be extending the bloom time of each blossom. 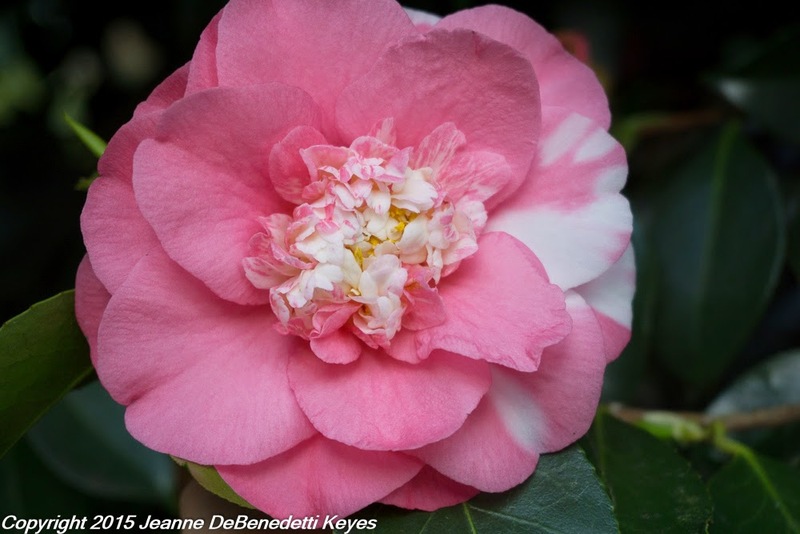 Camellia japonica is found in the wild, naturally occurring in the forests of mainland China,Taiwan, South Japan, and South Korea at elevations of 300–1,100 meters (980–3,610 ft). Camellias are hardy to USDA zone 6, growing to heights of 36 feet (11 meters) tall. C. japonica var japonica sport large, glossy, dark green leaves. The flowers range in color from red to pure white, and all colors and shades in between. 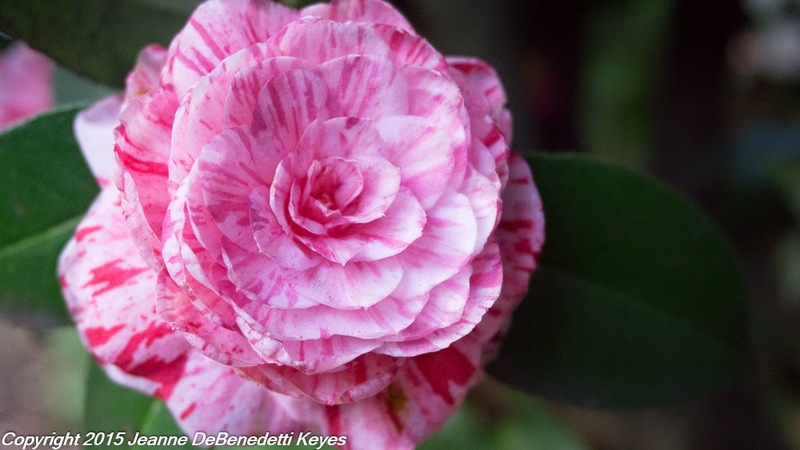 Although flowers are the main reason why many cultivars are available, camellias have lovely branching and if pruned with an eye to opening up the structure, will provide a beautiful evergreen specimen tree for the garden. It is not know when C. japonica was first cultivated in China. Most of the early paintings of the 11th century display the red flowers of the species. However, according to “The Garden Plants of China” by Peter Vader, the hanging scroll, Four Magpies, also 11th century, show a single, white cultivar, indicating that breeding occured much earlier. Modern cultivation have introduced many flower forms, petal types and color combinations. The first photograph is C. japonica 'Chandler's Elegans', displaying the flat, outer petals and inner petaloids of the 'Elegans' form, previously called the 'anemone' form. The flower in the second photograph may also be a variation of the Elegans form or possibly the 'informal double' form. This type was previously known as the 'peony' form. I am not sure which cultivar this is but I find the combination of large and tiny petals very interesting. The long, bright yellow stamens are very nice too. The form of this camellia, in the third photograph, is a classic rose shape, but it is probably considered a 'formal double'. The candy-cane, stripey color combination seems to be a favorite among the neighborhood children who love to come and pick flowers from my garden. Can't say that I blame them! The camellia in the last photograph, to the right, displays the regular outer petal combination of the 'formal double' but it has those tiny inner petals. Whatever the form or type, it's a lovely coral-pink color. As you can see, with so many color and petal combinations, it's hard to determine which cultivar is which. 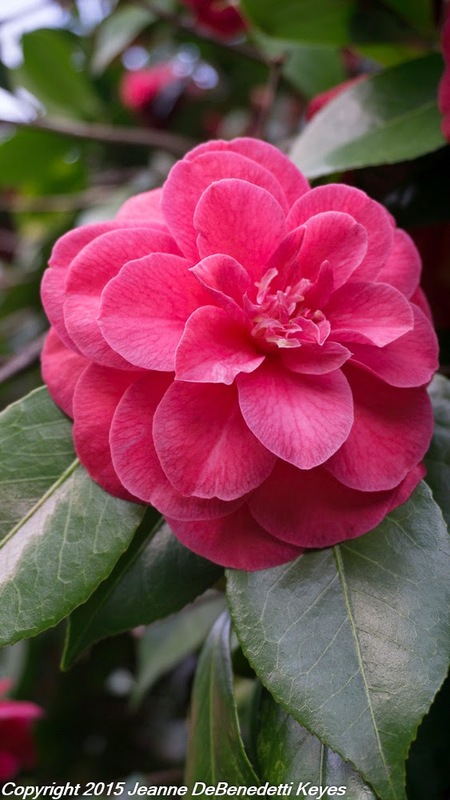 What a perfect opportunity to get the names of some of these cultivars and enjoy a fun, family outing at the Newberg Camellia Festival, tomorrow, April 11, 2015 at the Chehalem Cultural Center in Newberg, Oregon. 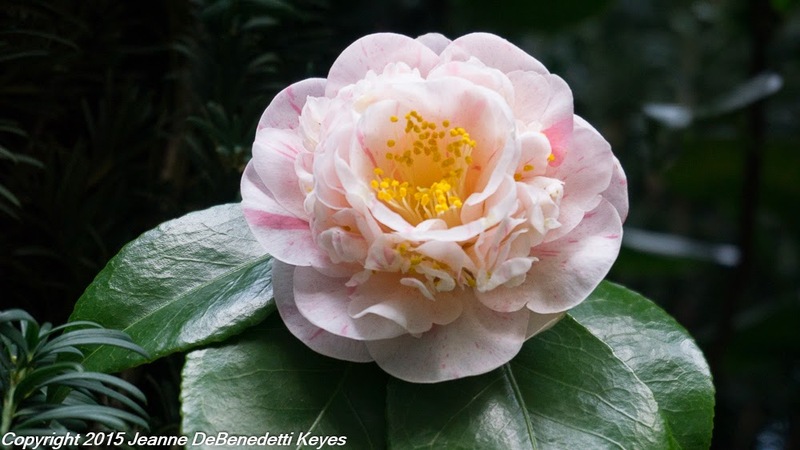 Not only is there the Oregon Camellia Society's Annual Bloom Competition but there will be camellias, japanese maples, hydrangeas and many conifers for sale. Music, lion and hula dancing and delicious food from a multitude of vendors round out a great family activity. I only have one Camellia in my garden, and it hasn't been there long, just a little over a year. It is blooming, but sparsely. I have high hopes for future years. They are such pretty flowers. Which one is it, Alison? They are pretty flowers! I do like the modern camellias, with a simpler petal structure like Yuletide. The downside is that camellias brown out and when they fall on grass, it smothers the grass and kills it. Hmm, maybe should just get rid of the grass! LOL.